“The Ferris Wheel” silenced the red-hot Brewers lineup by unleashing seven innings of one-run baseball. He allowed just two hits while striking out six, which established a franchise record for most strikeouts by a rookie pitcher in a postseason game. Collmenter effectively navigated his way through the Milwaukee batting lineup that produced 13 runs on 20 hits in the first two games of the series. Collmenter’s spectacular outing in Game 3 is just the latest of his impressive performances against the Brewers. In his July 6 start at Miller Park, he hurled six shutout innings while allowing just three hits and striking out three. Collmenter was just as good, if not better in his next start vs. Milwaukee as he tossed eight shutout innings while allowing just three hits and striking out seven in the 3-0 Arizona win. With his seven innings and just one earned run allowed on Tuesday, Collmenter has now surrendered just one earned run in 21 innings against Milwaukee this season. He owns a 2-0 record with a stellar 0.43 ERA in three career starts against the Brewers. Collmenter worked out of a mini-jam in the first inning of Tuesday’s game. After walking Ryan Braun and hitting Prince Fielder, he struck out Richie Weeks to end any potential scoring threat. His only blemish of the evening came in the top of the third when he surrendered a leadoff, solo home run off the bat of Corey Hart. 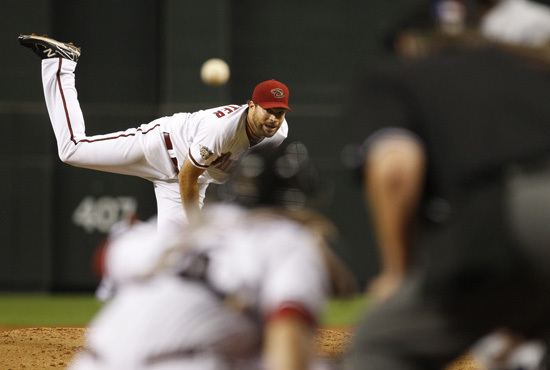 Collmenter quickly responded by retiring nine straight Brewer batters. He ended his dominant performance by retiring six in a row, including a 1-2-3 seventh frame. Collmenter did just that by giving his team a shot at winning. The D-backs cruised to an 8-1 win and forced a Game 4. Although the stakes were certainly high, the right-hander approached Tuesday’s start just like any other. When the D-backs were on the brink of elimination, it turns out the rookie Collmenter was just what they needed in a pivotal playoff situation.